Hey Guys! It seems like the classic smokey eye is one of the looks that most women struggle with most. It adds so much emphasis and sexiness to the eyes, but it’s easy for it to turn into a dark smudgy mess! 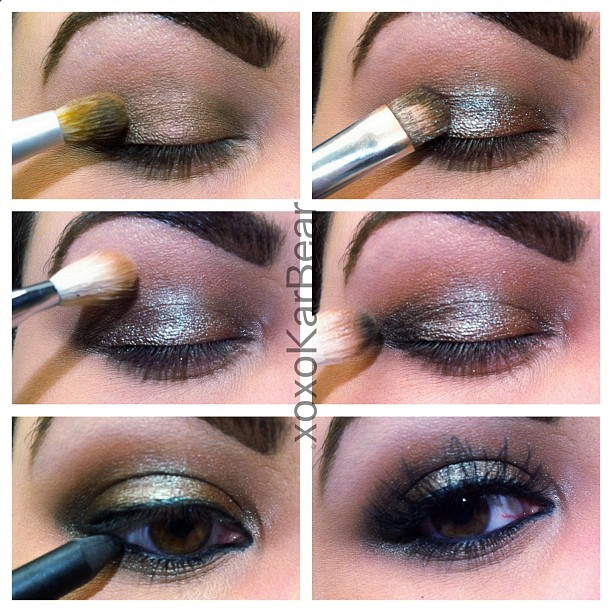 So here’s a quick tutorial to show you how to create a simple smokey eye. You can use this same technique with virtually any color combination that your heart desires! Just remember, the key is to blend, blend, blend! 1. Start by using a dark base. This will help the color to really pop, and to last all day long. Here I used MAC’s Constructivist Paint Pot and applied it with a stiff brush, but your finger would work just as well! 2. Apply shadow. This is going to set your base, and obviously be the main color of your look. I used MAC’s Bluebrown pigment, but you could use virtually any color! Browns tend to be the most common smokey eye color, but try to branch out and use purples, greens, golds, or even black if you’re feeling really bold! Just make sure to add color under your bottom lashes for a cohesive look. 3. BLEND, BLEND, BLEND! Take a medium toned brown and blend out your crease to blow out any harsh lines. This is what will make your look smokey. I used Cork from MAC with a 217 brush. 4. Darken up the outer corner. This will further deepen your look and make your eye look even more smokey and defined. I used that same 217 blending brush and Makeup Geek’s Corrupt shadow. Just a little bit of black shadow will make a world of difference! 5. Add liner. Take your favorite kohl liner and line your waterline and upper lash line. Here I used my personal favorite, Revlon ColorStay in Black. 6. Add mascara and top with lashes! Of course, the false lashes are always optional, but with darker looks it’s easy for your lashes to get lost in the shadow, so I like to add falsies for added drama. Don’t forget to coat those bottom lashes! Thanks for stopping by! If you recreate a smokey eye using this technique, I’d love to see it! Tag me on Instagram or Twitter @xoxoKarBear. If there are any looks you’d like me to post a tutorial on, please comment and let me know! I hope you all enjoy your Monday and that you have a fabulous week!